Upcycled Summit tees. Diverted from second hand store, overprinted. 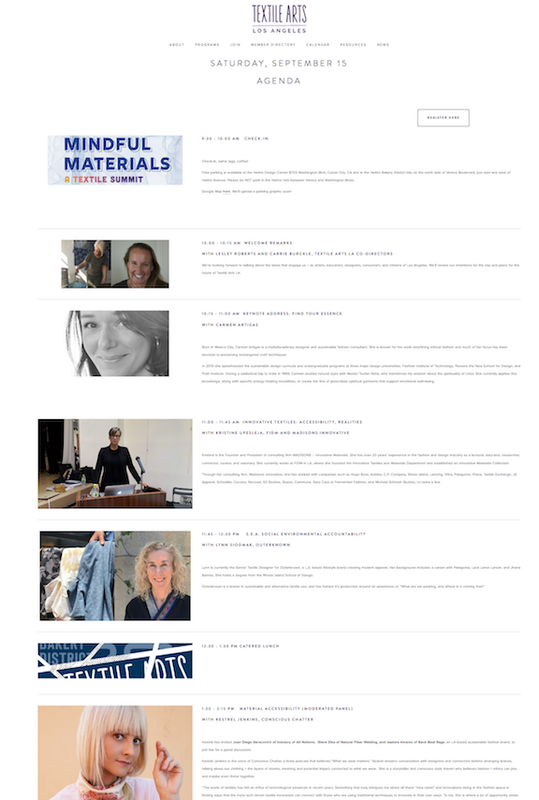 We invite you to join us for our first textile summit to explore questions, approaches, and responses to the concept of Mindful Materials. The textile, manufacturing, apparel, and "making" communities have been questioning – in a variety of ways and with a range of enthusiasm – the concept of sustainability, the power of innovation, the role of technology, and how collaboration rather than competition can be a path forward. As artists and community members, what is our role in these questions and to what degree do we turn to disruption, i.e., a radical rethinking of our ways of making and being in the world? How do we contribute to a meaningful dialogue and course of action – both in our intimate community and in our position within one of the largest urban environments and economic markets in the world? We've been inspired by the work of Navi Radjou, whose recent article in Fast Company was subtitled with this powerful statement: A sustainable economy won't mean much if we are still driven by a desire for unceasing consumption and mired in unhappiness and alienation. The questions we're asking are global in scope, and the answers are certainly beyond our immediate capacity to "solve," but the conversation itself will ultimately lead us to the deeply personal exploration of "How do we want to live in the world?" As artists, creators, makers, thinkers, and members of our community, we're ideally situated to discuss, address, and spread the ideas that come from our Summit. we will have a keynote speaker, panelists, a pecha kucha, and a late afternoon/early evening trunk show and cocktail hour / networking opportunity. Morning coffee, lunch, and parking are included. LINK TO AGENDA / SCHEDULE HERE. we will offer two opportunities to practice a mindful approach to material and process: Liz Spencer of The Dogwood Dyer will offer an all day Bundle Dyeing class, and Mending as Metaphor founder Ruth Katzenstein Souza will offer a midday Mending Circle. Mindful Materials should be of interest to practicing artists, emerging artists, designers, decision-makers, people working in the design, art, architecture, and apparel industries, active members of the LA community, the curious, the engaged, and the hopeful. We hope to see you there! Carmen Artigas, sustainable designer, consultant, and speaker, specializing in integrating ethical practices within the fashion industry. Arcana Books on the Arts (located next door to the venue) will be extending a discount on book purchases to all paid attendees! We're thrilled to offer an all-day, immersive workshop with local educator and natural dye expert Liz Spencer! 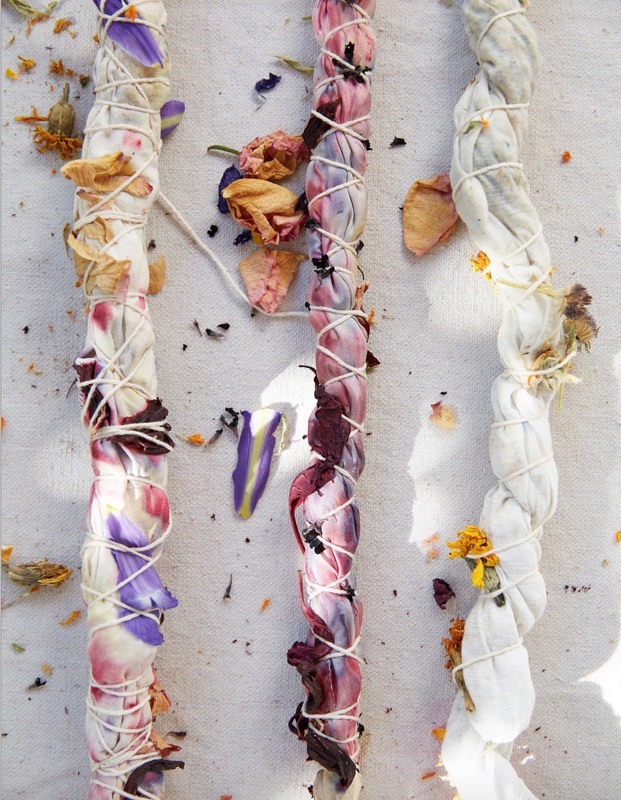 Her workshop will introduce us to the colorful world of natural dye plants, many of which are dual purpose edibles and have herbal/medicinal properties. In the spirit of our Summit's theme, we'll learn Liz's water-wise, mess-free technique of bundle dyeing. Liz will also dive into the techniques and actions that set her practice apart from other natural colorists, with a focus on sustainability, working with local plants, and environmental resiliency. Natural dye basics such as mordanting, extraction, and historical context will also be covered. Liz promises we'll be amazed at the colors attainable with natural substances! Each of us will leave with bundle dyed compositions on a variety of natural fabrics, resources lists, and an instructional guide on how to repeat the process at home. No previous dyeing experience necessary. Class size is limited. To sign up for the Saturday panels AND Liz's workshop, please use the REGISTER button upper left (discounted price if buying both days). THERE IS NO FEE FOR THE MENDING CIRCLE, BUT AN RSVP IS REQUIRED. PLEASE USE THE BUTTON RIGHT. This event is BYOLunch! Our Mending as Metaphor / Mending Circle will provide time for attendees to bring a textile or piece of clothing to repair, mend, embroider, patch, or transform. There will be time to share what you brought and explore techniques and materials that have been used historically and some that are particular to our time. As we are living in an increasingly disposable culture we will focus on the idea of repair as metaphor for treasuring what we have and the idea of what is “enough.” Please bring a small sewing kit with scissors, needles, thimble and thread as well as any particular materials you want to work with. To use our hands and our imagination in the company of other textile enthusiasts is a gift and a form of meditation. Can we connect to that by performing slow stitching in a fast-paced world? Ruth Katzenstein Souza has been holding Mending as Metaphor circles as well as maintaining a textile practice using found and re-purposed materials. APPLY TO PRESENT A PECHA KUCHA! We are conducting a Pecha Kucha on Saturday afternoon. A quick refresher: Pecha Kucha is the art of concise presentations, wherein you show 20 images, each for 20 seconds. If you would like to present your recent creative work, research, travelogue, or other relevant slides (relevant is a subjective concept but related to "mindful materials"), read more and apply here. We'd love to hear what you're working on and thinking about. Please plan to purchase a ticket to the Summit, for Saturday or the weekend, as you choose. Textile Arts | LA is grateful for the support of the Helms Design Center, without whom this Summit would not be possible.